Chennai : Tamil Nadu Assembly Speaker P. Dhanapal on Monday unveiled the portrait of late former Chief Minister J. Jayalalithaa in the Assembly while major opposition parties boycotted the function saying such an honour should not be given to a convicted person. The portrait was unveiled in the presence of Chief Minister K. Palaniswami, Deputy Chief Minister O. Panneerselvam and other state ministers. Addressing the gathering, Palaniswami said Jayalalithaa's fame would continue to exist as long as the Earth continues to exist. He said Jayalalithaa had restored the state's rights in the Cauvery river water issue-in the dispute with Karnataka on sharing the river water. Palaniswami said steps are being taken to build a memorial for Jayalalithaa. 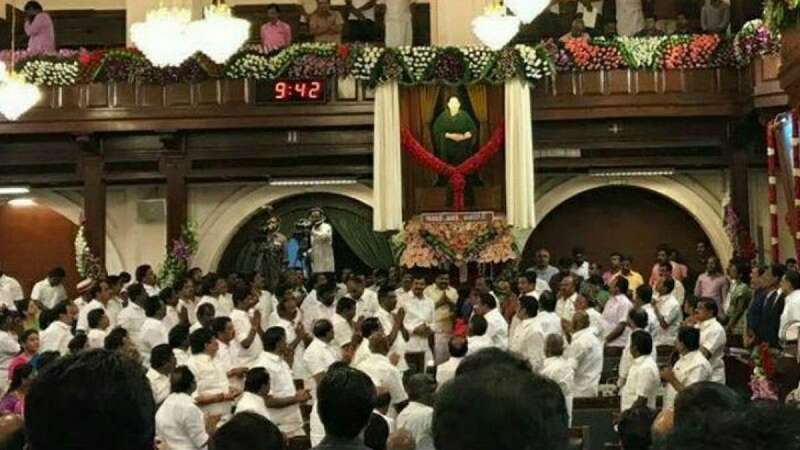 Meanwhile, opposition parties led by DMK, Congress, IUML boycotted the function stating that portraits of persons convicted in a corruption case should not be there in the Assembly Hall. DMK leader M.K. Stalin said Jayalalithaa was the "number one" accused in the disproportionate assets case, and was convicted in the case. A trial court in Bengaluru had held Jayalalithaa, her close aide V.K. Sasikala and two others as guilty and convicted them. While the Karnataka High Court acquitted all of them, the apex court upheld the trial court's judgement. Since Jayalalithaa had died before apex court's order, she was not jailed while three others are serving their sentence in a jail in Karnataka. Stalin said Jayalalithaa's portrait demeans the portraits of other leaders in the Assembly -- portraits of former Chief Ministers of Tamil Nadu, national leaders like Mahatma Gandhi, B.R. Ambedkar and others. Other parties like DMDK, PMK also opposed the move to unveil Jayalalithaa's portrait while the Bharatiya Janata Party (BJP) was in support of the government's action.